This morning, I woke up with a renewed passion. I always try to start my day giving thanks to God for waking me up. "Thank you, Lord" are the first words that I utter - not audibly but, very consciously. This is something that just comes so naturally for me because of what my parents and grandparents instilled in me as a child - that life is a blessing. I remember, as far back as 5-years-old, the last words that I spoke at night were a prayer - "Now, I lay me down to sleep, I pray the Lord my soul to keep. If I die before I wake, I pray the Lord my soul to take." Hands clasped, eyes closed and kneeling at the side of my bed, my little prayer would continue: "God please bless all the sick people and poor people." (Which really included US). Next, on my list was my family starting with "God bless Mom, Dad, Michael, Grandma, Mama Ashie, Daddy Jimmy, Papa, Mama Nonie, Grandpa Robinson..." and go on and on until I couldn't think of any more relatives. Then, I would give an "Amen", make the sign of the Cross, jump in bed, tucked in with a kiss on the forehead from Mom or Grandma. I had no worries as a child - never fearing that God would let me "die before I wake". Today...Michael, Grandma, Mama Ashie, Daddy Jimmy, Papa, Mama Nonie, Grandpa Robinson, and a host of others who were on my little prayer list, have gone on to heaven - their souls resting with God - just like I asked Him as a child and I know He has answered me. Life IS a blessing. But, it is also a challenge. My sleep as a child was never interrupted by worries of bills, job stress, bullying, the NFL's odd and changing domestic violence policy, Ferguson, ISIS, the missing girls in Nigeria and all the other world chaos we are confronted with when we turn on the news. 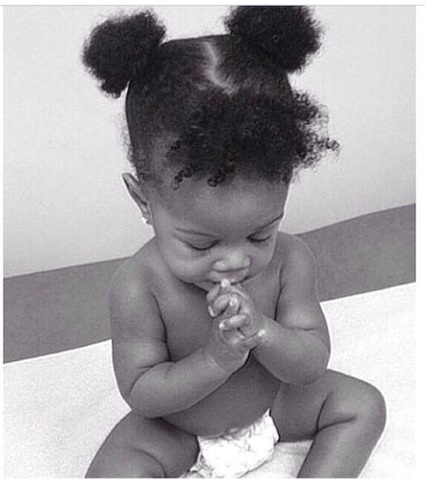 The caption that I posted along with the picture above of this incredibly angelic little baby was, "Just Pray". This photo and that simple message were met with close to a HALF MILLION "Likes" on my Facebook page and 10,000 comments - numbers that truly overwhelmed me. Just looking at this child in earnest prayer inspired so many. It's one of my favorite pictures ever. Someone said to me, "But we can't just pray away all of these horrible things happening in the world." We all know that is true. I said at the beginning that I woke up this morning with a renewed passion. Actually, that passion comes to me most mornings. It comes to me when I give thanks for another day to use every fiber of my being to change the world for the better. That passion comes to me when I thank God for my eyesight to see the things I need to help change, for my hearing to hear the voices of the girls I want to inspire, and for my health that enables me to get out of the bed and make a difference. Of course, we can't just pray away problems. But, we can use prayer to become more in tune to the needs of others and to have faith that God is working in us to give us the strength we need to meet every challenge with courage and optimism - that everything is evolving for our greater good. ~Amen.